This is the authentic Korean Kimchi recipe that’s been simplified from my grandmother’s complicated recipe. It’s an every day version that you can make any time of the year. Some people say Koreans are among the leanest and healthiest people on the planet. I don’t know about that but I do believe kimchi (or kimchee) has something to do with our health. 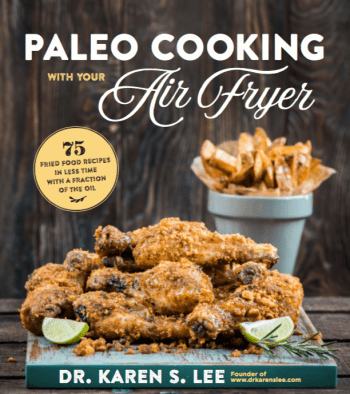 Recent studies say that it prevents cancer, helps with digestion because of probiotics and is a great anti-inflammatory food because of all the seasonings and herbs that go in it. And it’s true. Whenever I feel nauseous or have a stomach upset, a small sip of kimchi liquid calms it down. The funny thing is, kimchi was not that popular when I was growing up in the 70’s and 80’s in Queens, NY. If people knew or heard about kimchi back then, it was because of M*A*S*H*, a sitcom comedy depicting American soldiers in Korea during the Korean War. In fact, I had to brush my teeth 3 times before leaving the house in fear that people would jump out of the way, after smelling kimchi from my breath. But now, Queens is the mecca of Asian food and culture and kimchi is in every foodie and health conscious shopper’s grocery list. Kimchi is so “hot” these days, pun intended, that all the non-Koreans are making, eating, and demanding kimchi! People seem to be fine with the term, “fermented cabbage” when I describe what kimchi is. That was never the case. Wow Weee! What’s that smell??? Kimchi is to a Korean as ketchup is to an American. You can eat a meal without it, but it tastes so much better with it. 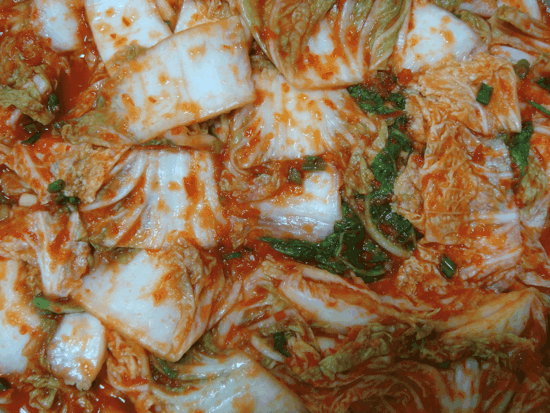 In fact, when I eat pizza or used to eat a hamburger, I sometimes craved kimchi along with them. The crisp, crunchy, spicy cabbage with a hint of sour taste, cleansed my palate after eating meat. I don’t eat it with every meal but I always have a jar in the fridge like I have ketchup. Yes, the garlicky odor can smell stinky when you open the jar initially but the spicy garlicky aroma is something you have to experience to know its addicting quality. Just ask an old friend of mine who told me recently that he tried to smuggle a jar through an airport security once and now he is blacklisted by the airline. Next to carrying a weapon on board, carrying a jar of kimchi through the security checkpoint will definitely put you on the “No Fly” list or clear out the airport before you can say, “kimchi!” So don’t even try it. Then, why would I recommend such a vile smelling dish? Who needs vitamins when you have Kimchi? Kimchi is packed with vitamins A, B, and C and immune system-boosting phytochemicals. Its main ingredient, fermented cabbage, contains lactic acid, which helps with digestion and may weaken infections. But the biggest benefit may be from lactobacilli in kimchi – healthy bacteria that helps with digestion stops and even prevents yeast infections. Several years ago, Korean researchers found chickens infected with the avian flu recovered more quickly after being fed an extract of kimchi. More recently, a study at the University of New Mexico suggested that eating cabbage might help ward off breast cancer. 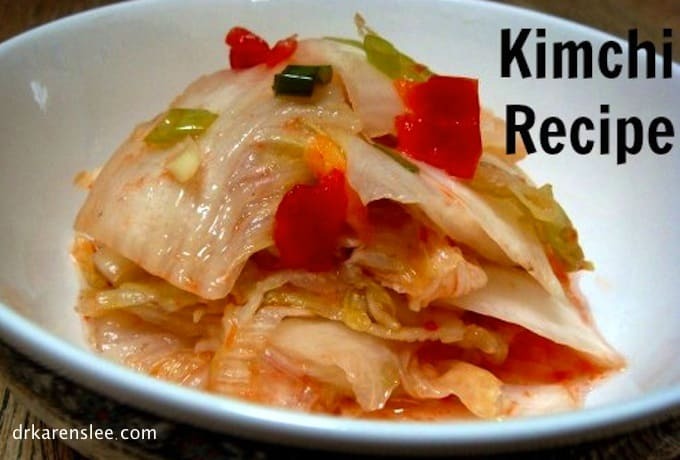 Kimchi is low in calories, rich in dietary fiber, low in fat, and low in carb. Some believe that kimchi has kept obesity at bay in Korea (although, since American fast food joints have been popping up everywhere in Korea, there have been increased cases of obesity. Damn those Big Mac’s and KFC’s!). And what’s even better, when kimchi gets ‘old’ or over-ripen, it is used in everything from soups to pancakes. 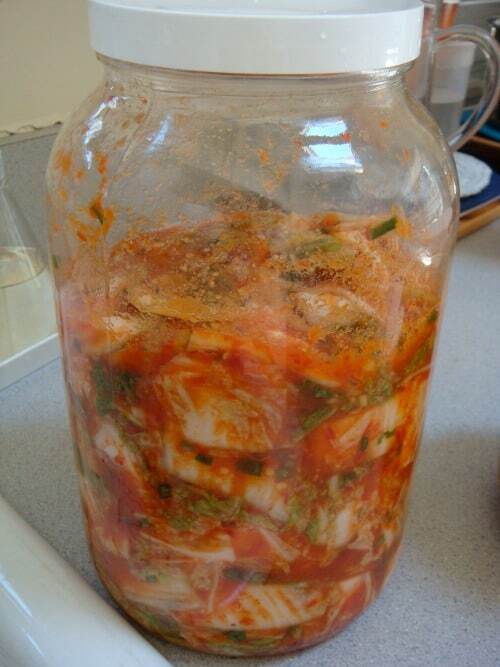 Every piece of kimchi is used up – nothing is wasted. My idea of a perfect gastronomic experience. There are some naysayers who cite Koreans and Japanese having higher rates of stomach cancers due to fermented foods but that’s been attributed to various factors and not just eating fermented foods. But one thing for sure, kimchi has been on the top of the list of foods to try as a result of recent researches done on the health benefits of kimchi here, here and here. And so many others. I can tell you, personally, it has helped me on many occasions when my immune system was on a strike. Growing up, my mom would make a hot bean sprout soup for me and she would put some spicy kimchi in the soup whenever I had the flu or a cold. It seemed to speed up the recovery. And if nothing else, the spicy hot steam would clear up my sinus and I could breathe easier. Kimchi broth was also an elixir for indigestion as my mom would make me take spoonfuls of it whenever I had a stomach virus. And even if I was not in the mood to eat anything by mouth, I tolerated little spoonfuls of Kimchi broth. 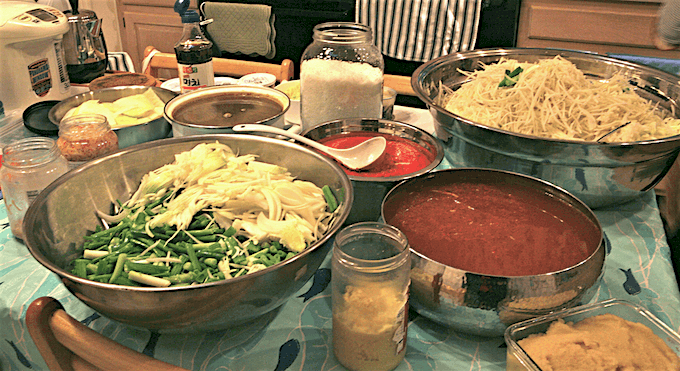 The thing is, it is labor intensive to make kimchi, especially if you are making it for the year in the winter. Back in the day, women in the ‘village’ would gather and make kimchi, literally, all day long for two days. And when they were done, they would divide up the portions equally, and they would store them in huge clay vats that they bury in their backyard for the winter. This method was used to preserve and slow down the fermentation process so that they can have kimchi throughout the brutally cold Korean winters without having to make it so often. There is even a special word, ‘Kim Jang‘, to describe this type of kimchi making ritual before the winter. This is our current day production my mom and I go through every winter, except in our warm kitchen. We normally make kimchi with intact Nappa cabbage leaves and stuffed them with the ingredients above. Then, they are stored in these special boxes for the kimchi refrigerator. Yes, there is such appliance to slow down the fermentation so it keeps kimchi longer. Anyway, this kind of traditional kimchi-making ritual has been simplified for the modern day a bit, but still, making even a small jar of kimchi by myself has always terrified me since it seemed too monumental to even fathom. Making kimchi, using a ‘secret’ recipe that was handed down through generations, is like making your grandma’s apple pie with her secret recipe. Every woman has a different way of making it and there is a sense of pride and mystery that shroud a good kimchi recipe. So, that’s another reason why I never even tempted to make it by myself, in fear of failure, without my mom’s help. But this year, “I made kimchi!” – as I squealed loudly when I made it for the first time, like Tom Hank’s character in Cast Away, when he shouts “I made fire!! !” And it was ridiculously, I mean, ri-di-culous-ly E.A.S.Y.! Ok, so it was not the original, “30+ ingredients-with-one-more-secret-ingredient-just-because” kind of Kimchi but hey, you gotta make ‘do’ when it’s just “me, myself, and I” making the stuff and not with the help from a whole village! So here is my ‘secret’, ridiculously easy kimchi recipe. (Forgive me Grandma for this 21st century watered down, simplified version.) But before the recipe…..I know. I know. This has been a long post already but here are some of my kimchi making tips. I learned a few things in the process and I’ll share this valuable wisdom I’ve acquired with you. 1. It takes at least three days to make kimchi so don’t think you’ll start the darn thing at 3 PM and have it for dinner. There’s no shortcut in kimchi making. 2. 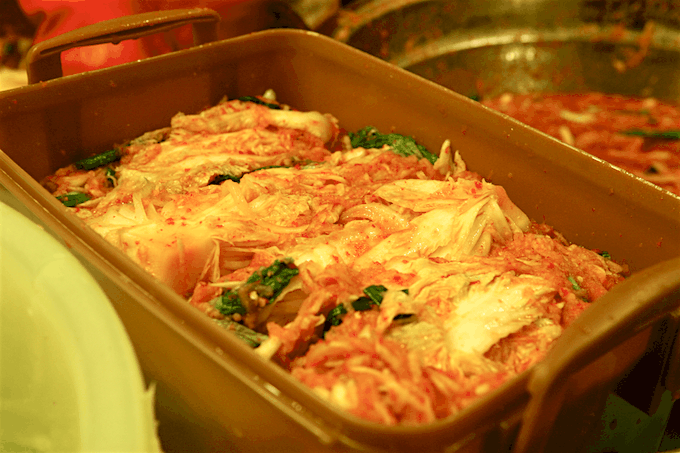 Traditionally – and don’t ask me why – kimchi has some sort of fish or shrimp extract in it. Forget that ingredient for my recipe. As far as I’m concerned, kimchi could be Paleo or vegan, depending on whether you use the fish sauce or not. Oh, and by the way, if you think the store bought ones are vegan, think again. They are not. That’s why it’s so much better to make it at home. You can also control how much sugar you use. For my kimchi, I don’t use sugar but some people do, to speed up the fermentation. 3. Kimchi masters would tell you, it’s all in the salt. Use it too sparingly and you’ll have a stringy mushy mess. Use it too much, you’ll end up with a just salty goopy mushy mess. 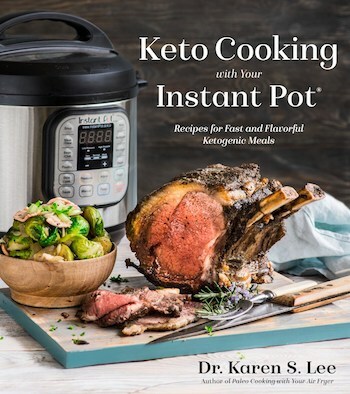 But use it just right – and you know how it’s never a ‘tablespoon’ of this and ‘teaspoon’ of that but a ‘dash’ of this and ‘smidgen’ of that – and you’ll be good to go. But I did learn one solid fact; use good quality Sea Salt. Never table salt. You don’t want highly processed table salt. I recommend sea salt with high mineral content. 4. Always use red pepper – I used “Ancient Sweet Red Pepper” for mine. You can add one little spicy hot pepper to taste but believe it or not, I don’t like very spicy kimchi. If you can’t find Ancient Sweets, you can use red bell peppers. If you use habaneros, be ready to drink lots of water because, after kimchi ferments, it might get spicier. Or it might get sweeter but not less spicy. Trust me. Also, there are packaged red pepper flakes called, “Go Chu Gah Ru“ (Korean hot pepper flakes. Amazon Affiliate Link) sold in Korean grocery stores but it’s really tricky to buy the ‘right’ one. Some might be stale and some might be too spicy and you won’t know until you use it and no, the packages do not tell you the grades of spiciness. But do not fear; you can find all the ingredients for this recipe in your supermarket so you don’t have to search high and low for a Korean grocery store for the right ingredients for this one. Ready? Here is the ultimate kimchi recipe even my grandma would be proud of. 1. 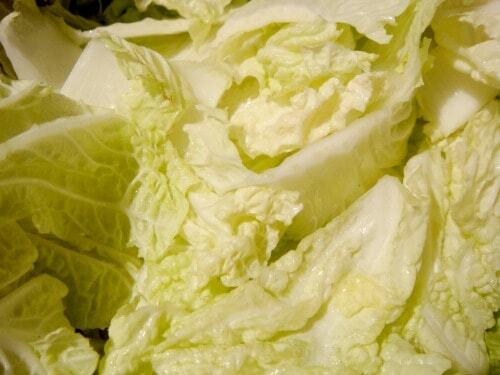 Separate Napa Cabbage leaves and wash them thoroughly to rid of all the dirt hidden within the leaves. Drain well, chop them in one-inch widths and put them in a large glass, flat bottom, bowl or a pot. Sprinkle salt evenly…about 1 tsp of salt to a hand full of cabbage. Cover and store the cabbage in a cool place overnight – or for at least 5 hours. 2. As pictured above, there will be a little bit of liquid formed in the bottom of the bowl when cabbage gets marinated in salt. Mix the cabbage mixture and taste. If it’s salty enough, then, you are ready to proceed but if it’s not, then, add more salt, one teaspoon at a time. If you add more salt, wait another a couple of hours, and then, taste again. 3. If you are happy how salty it is, then, you are ready to add the rest of the ingredients. 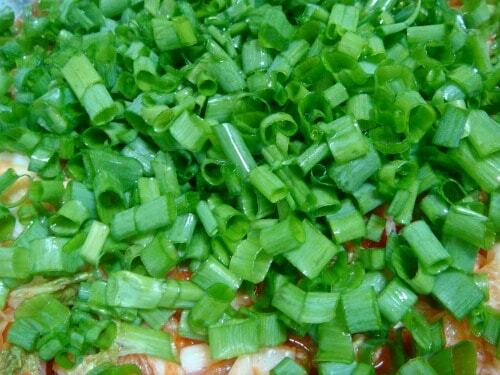 Scallions are not pictured here but you will add them later when you are mixing. 4. Add garlic, onion, peppers, ginger, and water to a food processor or a blender (don’t use the one you use to make margaritas, otherwise, your guests won’t like the garlic tasting margaritas after making kimchi in it) and puree. It’s OK to see little specks of pepper but you shouldn’t have chunks. 5. Add the puree mixture and chopped scallions to cabbage and mix really well. 6. Place the cabbage in a large glass jar – a large mouth glass jar works really well since you’ll be taking out kimchi every time you want to eat it. 7. Take a large spoon and push down the cabbage until all are submerged in the liquid. 8. Store in room temperature ( 75 〫F) for a couple of days. Don’t put the lid on too tight. Burp the bottle after a day or two or when you see bubbles forming on top. 9. After a day or two, depending on how warm the room temperature is, move the jar to the refrigerator for future consumption. NOTE: Some of the ‘secret’ ingredients used in kimchi include sugar (for helping probiotics to ferment faster but you don’t taste the sweetness afterward,) fish sauce, shrimp extract, oysters, pine nuts, radish, cucumber, Asian pear, pepper threads, daikon, sugar and even MSG! But I simplified and included only the essential ones for this recipe. 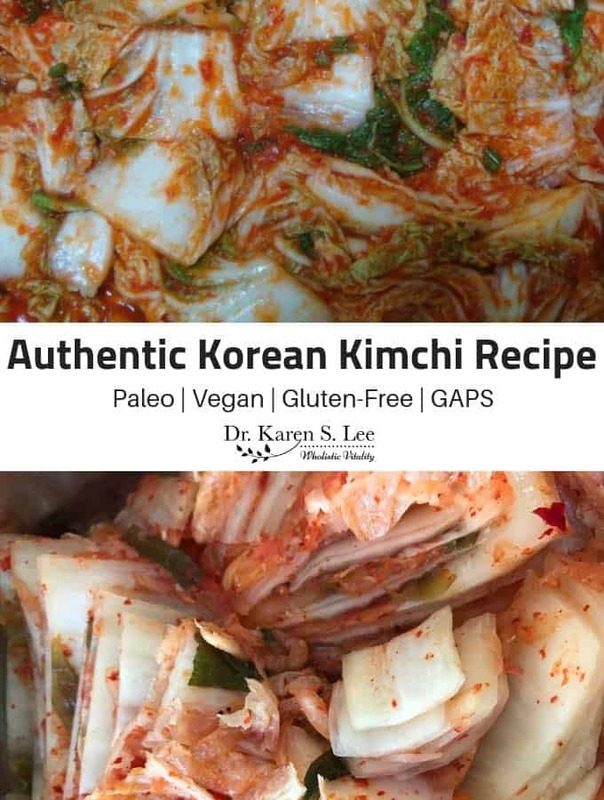 And since this version only has vegetables, it’s vegan and shellfish allergy-friendly and just as good as any of those “secret” handed- down-from-generation-to-generation-from-the-Han-dynasty kimchi recipe. P.S. My mom asked me how I made such a great kimchi, so simply. Now that was a compliment! So if you want to be “lean” and healthy like us, the Koreans, start consuming massive amounts of kimchi. Just make sure your partner has some too so that you won’t reek of kimchi breath. If you make this recipe, please rate it below. I’d love to find out how it turns out for you. Separate Napa Cabbage leaves and wash thoroughly to rid of all the dirt hidden within the leaves. Drain well, chop them in one inch widths and put them in a large glass, flat bottom, bowl or a pot. Sprinkle salt evenly...about 1 tsp of salt to a hand full of cabbage. Cover and store the cabbage in a cool place over night - or for at least 5 hours. As pictured above, there will be a little bit of liquid formed in the bottom of the bowl when cabbage gets marinated in salt. Mix the cabbage mixture and taste. If it's salty enough, then, you are ready to proceed but if it's not, then, add more salt, one teaspoon at a time. If you add more salt, wait another a couple of hours, and then, taste again. If you are happy how salty it is, then, you are ready to add the rest of the ingredients. Scallions are not pictured here but you will added them later when you are mixing. Add garlic, onion, peppers, ginger and water to a food processor or a blender (don't use the one you use to make margaritas, otherwise, your guests won't like the garlic tasting margaritas after making kimchi in it) and puree. It's OK to see little specks of pepper but you shouldn't have chunks. Add the puree mixture and chopped scallions to cabbage and mix really well. Pour the cabbage into a large glass jar - a large mouth glass jar works really well since you'll be taking out kimchi every time you want to eat it. Take a large spoon and push down the cabbage until all are submerged in the liquid. Store in room temperature ( 75 ºF) for a couple of days. Don't put the lid on too tight. Burp the bottle after a day or two or when you see bubbles forming on top. After a day or two, depending on how warm the room temperature is, move the jar to the refrigerator for future consumption. Repeat after me. "I made kimchi!"